A huge cloud of volcanic ash and gas rises above Mount Pinatubo, Philippines, on June 12, 1991. Three days later, the volcano exploded in the second-largest volcanic eruption on Earth in this century. Timely forecasts of this eruption by scientists from the Philippine Institute of Volcanology and Seismology and the U.S. Geological Survey enabled people living near the volcano to evacuate to safer distances, saving at least 5,000 lives. On July 16, 1990, a magnitude 7.8 earthquake (comparable in size to the great 1906 San Francisco, California, earthquake) struck about 60 miles (100 kilometers) northeast of Mount Pinatubo on the island of Luzon in the Philippines, shaking and squeezing the Earth's crust beneath the volcano. At Mount Pinatubo, this major earthquake caused a landslide, some local earthquakes, and a short-lived increase in steam emissions from a preexisting geothermal area, but otherwise the volcano seemed to be continuing its 500-year-old slumber undisturbed. In March and April 1991, however, molten rock (magma) rising toward the surface from more than 20 miles (32 kilometers) beneath Pinatubo triggered small earthquakes and caused powerful steam explosions that blasted three craters on the north flank of the volcano. Thousands of small earthquakes occurred beneath Pinatubo through April, May, and early June, and many thousand tons of noxious sulfur dioxide gas were also emitted by the volcano. 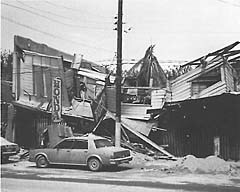 Following Mount Pinatubo's cataclysmic June 15, 1991, eruption, thousands of roofs collapsed under the weight of ash made wet by heavy rains (see example in photo above). Ash deposits from the eruption have also been remobilized by monsoon and typhoon rains to form giant mudflows of volcanic materials (lahars), which have caused more destruction than the eruption itself (photo at right shows village buried by lahars). (Photo above courtesy of Peter Baxter, University of Cambridge. From June 7 to 12, the first magma reached the surface of Mount Pinatubo. Because it had lost most of the gas contained in it on the way to the surface (like a bottle of soda pop gone flat), the magma oozed out to form a lava dome but did not cause an explosive eruption. However, on June 12 (Philippine Independence Day), millions of cubic yards of gas-charged magma reached the surface and exploded in the reawakening volcano's first spectacular eruption. When even more highly gas charged magma reached Pinatubo's surface on June 15, the volcano exploded in a cataclysmic eruption that ejected more than 1 cubic mile (5 cubic kilometers) of material. The ash cloud from this climactic eruption rose 22 miles (35 kilometers) into the air. 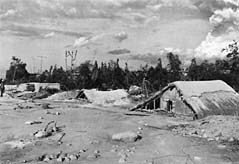 At lower altitudes, the ash was blown in all directions by the intense cyclonic winds of a coincidentally occurring typhoon, and winds at higher altitudes blew the ash southwestward. A blanket of volcanic ash (sand- and silt-size grains of volcanic minerals and glass) and larger pumice lapilli (frothy pebbles) blanketed the countryside. Fine ash fell as far away as the Indian Ocean, and satellites tracked the ash cloud several times around the globe. Much weaker but still spectacular eruptions of ash occurred occassionally through early September 1991. From July to October 1992, a lava dome was built in the new caldera as fresh magma rose from deep beneath Pinatubo. Even after more than 5 years, hazardous effects from the June 15,1991, climactic eruption of Mount Pinatubo continue. The thick, valley-filling pyroclastic-flow deposits from the eruption insulated themselves and have kept much of their heat. These deposits still had temperatures as high as 900°F (500°C) in 1996 and may retain heat for decades. When water from streams or underground seepage comes in contact with these hot deposits, they explode and spread fine ash downwind. Since the climactic 1991 eruption, ash deposits have also been remobilized by monsoon and typhoon rains to form giant mudflows of volcanic materials (lahars). Fortunately, scientists from the Philippine Institute of Volcanology and Seismology and the U.S. Geological Survey had forecast Pinatubo's 1991 climactic eruption, resulting in the saving of at least 5,000 lives and at least $250 million in property. Commercial aircraft were warned about the hazard of the ash cloud from the June 15 eruption, and most avoided it, but a number of jets flying far to the west of the Philippines encountered ash and sustained about $100 million in damage. Although much equipment was successfully protected, structures on the two largest U.S. military bases in the Philippines--Clark Air Base and Subic Bay Naval Station--were heavily damaged by ash from the volcano's climactic eruption. 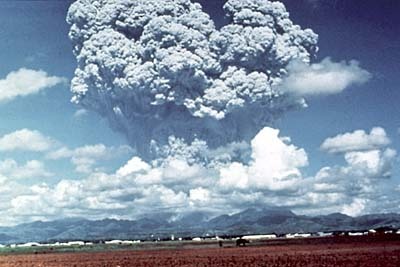 Nearly 20 million tons of sulfur dioxide were injected into the stratosphere in Pinatubo's 1991 eruptions, and dispersal of this gas cloud around the world caused global temperatures to drop temporarily (1991 through 1993) by about 1°F (0.5°C). The eruptions have dramatically changed the face of central Luzon, home to about 3 million people. About 20,000 indigenous Aeta highlanders, who had lived on the slopes of the volcano, were completely displaced, and most still wait in resettlement camps for the day when they can return home. About 200,000 people who evacuated from the lowlands surrounding Pinatubo before and during the eruptions have returned home but face continuing threats from lahars that have already buried numerous towns and villages. Rice paddies and sugar-cane fields that have not been buried by lahars have recovered; those buried by lahars will be out of use for years to come.